A new Madonna album is a big deal. 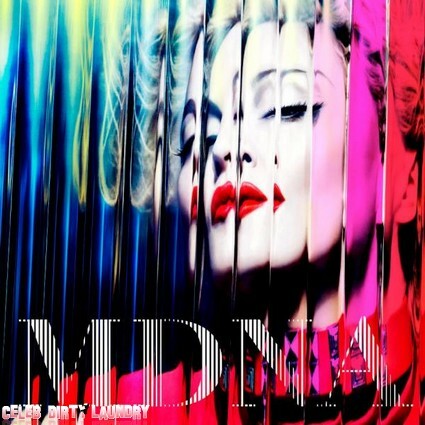 So I for one am super excited to see the MDNA cover for the first time. Madge released this exclusive pic on her official Facebook page as part of her media assault in the lead up to the album’s release on March 26. Major buzz is building about the Queen of Pop’s 12th studio album. Move over Lady Gaga – the original trailblazer is back, baby – and she’s coming to claim her throne! The colorful cover – featuring the Material Girl looking a lot like she did on the front of her first album 30 years ago – is in stark contrast to the cover for the first single Give Me All Your Luvin’. That is a strictly black and white affair. This one certainly jumps out at you! As we reported on Celeb Dirty Laundry the first Madonna video from the new album will get it’s world premiere on American Idol this Thursday night just hours before going on sale. Then it’s full steam ahead to the Superbowl. More big names have been announced for the half time spectacular. Nicki Minaj and MIA are now confirmed for Sunday’s much anticipated performance.